Immediately after the Food Sovereignty Prize, Rachel flew to Taos, New Mexico to represent NFFC and USFSA at the Growing Food and Justice Initiative Gathering. She attended the Intensive Leadership Facilitation Training as well as the main conference to join the conversation about racism and structural inequality in our food system. Rachel outlined the history and policies that have led to the systematic disenfranchisement of Black farmers from their land, based on her interview with Dania Davy, attorney with the Land Loss Prevention Projection, for the Farmland Monitor. Rachel also discussed the current agricultural/land investment practices of pension funds, such as TIAA-CREF, and the difficulties presented by foreign ownership of land. Oscar shared his personal and family story about NAFTA, which effectively forced him to leave his home in Guatemala, like so many Immokalee workers. He also noted some of the strategies CIW uses to organize and fight for the rights of their workers. Andrianna offered stories from fishers on all of our coasts and the struggles they face dealing with quotas and consolidation in the market. These struggles mirror those faced by farmers and ranchers. Then we asked workshop attendees to share resource grabs in their community, cross community connections, and strategies for working together. 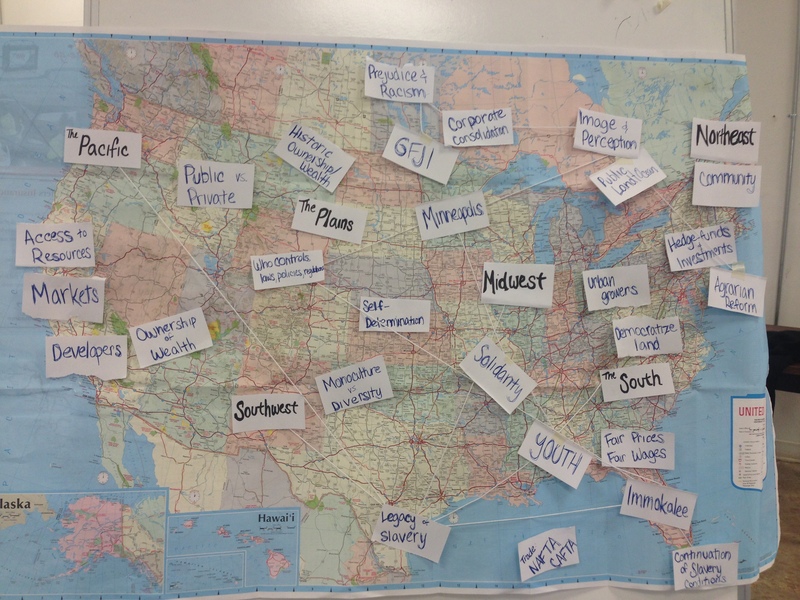 We mapped our locations as well as some key themes that connected our communities. Check out the map below. Overall, the gathering was a great experience and offered time to reconnect with activists inside and outside the USFSA. One of the best aspects, however, of the gathering was our ability to really engage with Taoseños, our hosts – the Taos County Economic Development Corporation, and a number of tribal leaders from New Mexico. The gathering was designed first to be a cultural sharing and learning opportunity, and second to be a traditional conference. In the future, GFJI would provide an excellent opportunity to connect rural and urban agriculture/food access issues more explicitly. The audience is very receptive and aware of structural issues impeding farmers’ ability to get fair prices, but collaboration with urban food justice leaders would broaden understanding by the larger public. To elevate fair prices as a cornerstone in the food justice debate, GFJI could be a strategic place to begin. This entry was posted in Blog and tagged Black Farmers, CIW, Consolidation, Fair Prices, Fishers, Food Justice, Food Sovereignty, GFJI, Guatemala, Investments, Land Disenfranchisement, Land Grabs, Legacy of Slavery, Mapping, NAFTA, Place Based, Quotas, Resource Grabs, Rural Urban Connections, TIAA-CREF, USFSA. Bookmark the permalink.